In 1967 the Toronto Maples Leafs were mostly a veteran hockey team with players like Johnny Bower (age 42), Red Kelly (age 39), Terry Sawchuk (age 37) and Tim Horton (age 37). Younger players included Eddie Shack (age 30), Frank Mahovlich (age 29), Dave Keon (age 27) and Ron Ellis (age 22). Frank “King” Clancy was behind the bench as coach after “Punch” Imlach was admitted to hospital following a season that was marked by the longest winless streak of eleven games and the longest losing streak of ten games. To say that they were the underdogs going into the playoffs would have been a drastic understatement, but they managed to beat the Chicago Black Hawks in the semi-finals in six games thanks in part to solid goaltending on the Leaf team and the untimely injuries to the Chicago goalie, Glen Hall, and sharp-shooter, Bobby Hull. Few people expected much more from the Leafs especially when the team they would play in the finals, the powerful Montreal Canadiens were going into the finals on a fifteen game undefeated streak, led by rookie goaltender, Rogie Vachon. From 1968 – 1979, the Montreal Canadiens built an incredible record of winning Lord Stanley’s cup 8 times! After a particularly exhuberant winning streak of four Cup victories from 1976 – 1979, each time marked by a wild outburst of joyous celebration on my part, and a considerable amount of “smack-talking” about the brilliance of MY team as compared to the dismal showing of his team…my Dad refused to watch hockey with me anymore. “C’est la vie!” I said and mocked him even more by attempting to speak french at every opportunity. A Montreal Canadien dynasty was born during those years and, at least in my mind, has never since been equalled by any other hockey team…except maybe our Canadian women’s Olympic Hockey team. Yeah, you go girls!! In the 1975-1976 season, goaltender and Vezina Trophy winner, Ken Dryden aided by stellar defensemen, Serge Savard, Guy Lapointe and Larry Robinson had the best goals against average and led in shutouts. Great skaters like Yvan Cournoyer, Steve Shutt, Peter Mahovlich, Doug Risebrough, Bob Gainey, Doug Jarvis, and Jacques Lemaire dominated the ice. But it was MY hockey hero, Guy Lafleur who scored 56 times in that season and with the additional 69 assists he generated earned him the scoring title and the Art Ross Trophy. While other teenaged girls had Donnie Osmond and Michael Jackson posters tacked up in their bedrooms, I had Montreal Canadian posters and pictures of Guy Lafleur! I wore my #10 Montreal Canadien jersey everywhere! My teachers even called me “Guy” in class whenever they noticed that far away day-dreamy look come over me…especially during math class. When I got married in 1979 and we moved to Alberta…pre Flames era, I still cheered on the Canadiens although my husband, to be contrary, would cheer for any other team that played against Montreal. He has an “ABC attitude” towards hockey…”Anything But Canadiens”. I still love him. In 1985 Guy Lafleur retired after playing for the Canadiens for fourteen seasons. I think I actually cried a little bit. 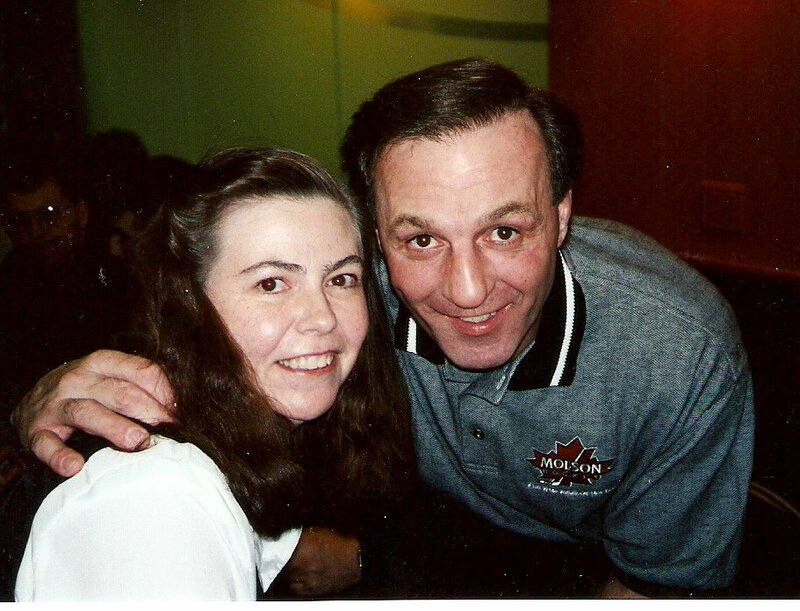 Eleven years later at an “Oldtimer’s Hockey Challenge” event at the Saddledome in Calgary, a hockey dream came true for me…I met Guy Lafleur in person! I think I actually cried a little bit then too! As I reflect back over these many years, certainly the game of hockey has changed and I’m not sure for the better. I will admit that once the NHL continued adding more and more Canadian and American “expansion” teams, and it became more of a business than just playing the game for the game itself, I lost a lot of interest in it. Still, without fail, once the playoffs start I’m just as caught up in the excitement of the game as I ever was. I don’t pay much attention anymore who might be playing for which team because the way the business is now, players get traded to other teams so often that even the trading card franchise can’t keep up with them. I suppose it all sort of started to crumble once Gretsky jumped ship in Edmonton in 1988. There’s just no team loyalty anymore. Sad, but true. During playoffs however, it’s become a tradition in our household each year to cheer on the Canadian teams first and if our Canadian teams are eliminated before the finals, we’ll go for the “underdog” American team. With both Edmonton and Calgary heading to the golf links early (ie: they failed to make the playoffs), our family sided with the next best team. Again there’s a certain pecking order (or should I say “picking ” order) for who we cheer for. The unwritten rule is that we cheer for the Western Canada teams first and then the Eastern teams last. I’m sure if we lived in the east it would be vice versa. My family, and I’m sure I speak for all Canadians, are loyal to the geographic makeup of our land. Weird but true. This year the Canadiens might be considered a “Cinderella” team. Even with 24 Stanley Cups, (including their first in 1916, before the NHL existed) behind them, that’s all history. Their last Cup was hoisted in 1993. Could this be the year for Montreal to win its 25th Stanley Cup? All Canadians will and should be cheering them on, after all,… it’s a Canadien Game! This entry was posted in Canadiana, Family Life, Proverbs 16:9 - Journey Thoughts and tagged Canada, Canada's Game, Chicago Black Hawks, Family, Guy Lafleur, History, Hockey, Hockey History, Montreal Canadiens, Montreal Canadiens Dynasty, Sports, Toronto Maple Leafs. Bookmark the permalink.